Here are our answers to the most common ones. Q: What are the average elevations? A: The average elevation in Arlington Place is 21 feet ABOVE sea level with some areas as high as 40+ feet. Q: Will i need to purchase flood insurance to build or buy? A: No. Residents of Arlington Place are not required to purchase flood insurance. Q: How big is arlington place? A: Arlington Place is approximately 928 acres. Q: What are the hoa dues? A: HOA dues are $800 annually for a home and $600 annually for an undeveloped lot. Q: What is included with the hoa dues? Use of Burton Village Clubhouse, including the great room, fitness room and kitchen. Use of the pool, tennis courts, basketball court, volleyball court and playground. Use of the boat ramp and fishing pier. Use of the Canoe and Kayak Outfitters Center. Option to host private parties at the Outfitters Center and Clubhouse at no charge. Use of the dock accessing Mill Creek and the Neuse River at the Outfitters Center. Use of the neighborhood kayaks. Use of the waterfront parks and beach. Docking privileges at the Mill Creek Community Dock (based on availability). Use of the walking trails and boardwalk throughout the neighborhood. Participation in annual neighborhood events. Use of the on-site storage area, which is fenced, gated and locked. Also included in your dues: management company fees, amenity insurance, security gates, common area maintenance, amenity building maintenance, street lights, common area utilities, amenity landscaping, pool maintenance and more. Q: Is owner financing available? A: Yes. Owner financing is available for developer-owned lots. Q: How do the neighborhood gates work? A: The gate is open in the morning and closed at night. All owners choose their personalized gate code and are given a gate remote. Q: When can i use the pool? A: The pool is available to all owners and renters from early May to mid October, from 9:00am to 9:00pm. Q: How far is arlington place from the surrounding towns? 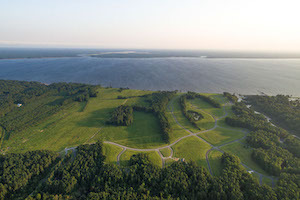 A: Arlington Place is approximately 4 miles from the Minnesott Beach ferry, 12 miles from Oriental, 22 miles from New Bern and 15 miles from Havelock. Q: Where is the nearest hospital? A: The nearest hospital is in New Bern, about a 30-minute drive. There is also a Nova Urgent Care in Grantsboro, about 15 minutes away. Q: Are the schools close by? A: The Arapahoe Charter School, serving students in K-12, is located right across the street from Arlington Place! Children also have the option of going to Pamlico County Schools, located in Bayboro. Q: What is the average lot size in arlington place? A: Lot sizes at Arlington Place are 1/2 acre+ on average. Q: Is there a minimum square footage requirement? A: Yes, we have a minimum square footage requirement of 1,600 (heated) square feet or 2,500 for riverfront lots. Q: Is there a timeframe to build? A: No. You can purchase your lot and build whenever you are ready. Q: Do we have to use your builders? A: You are more than welcome to use your own builder, but they must first get approved by our Architect Review Board (ARB). However, we have some great Signature Builders to choose from! Q: Who are your builders? 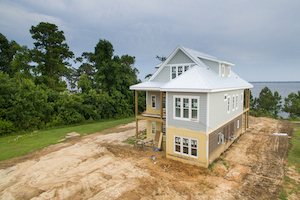 A: We have three Signatures Builders: Coastal Heritage Construction, Zaytoun Construction and Stroud Custom Homes. Info can be found on the Signature Builders page of this website. 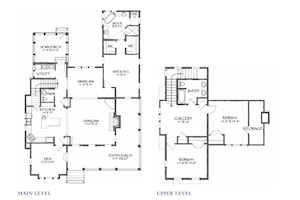 Q: Do we have to use predetermined house plans? A: Most of the homes in Arlington Place are custom. The floorplans on our website are ideas to get you started. You can use your own plans, but they must be approved by the Architect Review Board (ARB). 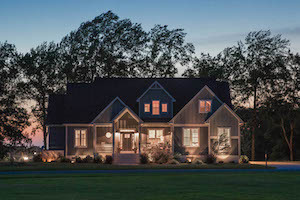 We do try to keep with a "country coastal" style. A: At Arlington Place, our utilities are underground. They include lines for electricity, telephone, fiber-optic internet, and city water. Every homesite is on private on-site septic. We have satellite television and propane gas. Q: How deep is mill creek? A: Mill Creek is about 4 to 6 feet deep with a wind-driven tide. 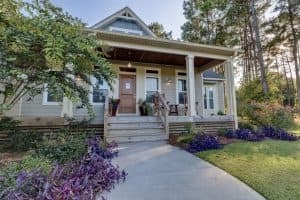 Q: How do i rent an on-site cottage? A: We rent our on-site Outfitters Cottages through airbnb.com. To view our cottages, go to the Arlington Place website and click "Rental Cottages". A: The developer of Arlington Place is Burton Farm Development Company, a division of Boddie-Noell Enterprises. Do some digging on them; we think you'll like what you find! The developer owns Arlington Place free and clear, so there is no fear of being left "high and dry"! Q: How much am i going to pay in property taxes? A: Property taxes are prorated as of the date of closing on a homesite. County and town taxes are at a combined rate of $0.8675 per $100 of assessed value. For example, the annual taxes on $100,000 would be approximately $867.50. Oriental, "The Sailing Capital of North Carolina"
Water Activities: Crabbing, Fishing, Sailing, Kayaking, Canoeing, Boating, Water Skiing, Wake Boarding, Swimming, water Aerobics and More. Numerous Marinas, Diversified Shopping, Hotels, Museums, Bed & Breakfasts, Sailing and Fishing. Beach Activities: Surfing, Sunbathing, Scuba Diving, Surf Fishing, Pier Fishing and Deep Sea Fishing. Numerous Hospitals, Aquariums, Malls and Airports.